Began what we hope will be a long and successful partnership with The North Face. Started our very own GDTA Twitter account in November. The dates and location for our 2015 Trail Maintenance Trip have been determined. Join us in the mountains. Build trail. Sleep under the stars. Be inspired. Let me know if you are interested in participating in the 2015 GDTA Trail Maintenance Trip or if you’re not able to participate on the actual trip dates but would like to help with some of the pre-trip planning activities. We can use your help! Stay tuned for more information. 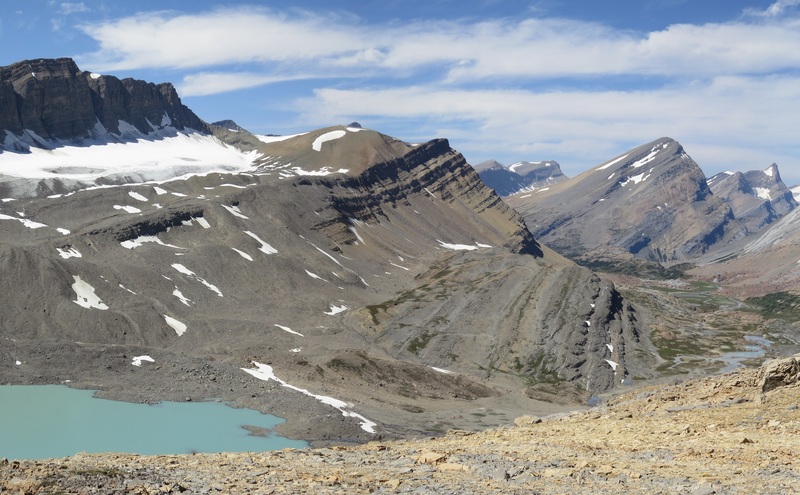 Interested in learning more about the Great Divide Trail and the work of the GDTA? Check out the GDT presentation at the “Best of BC Adventure Theatre” at 11:30am on March 7th at the Outdoor Adventure & Travel Show at the Vancouver Convention Centre. Check out the GDT presentation on the “Best of Alberta Adventure Theatre” at 3:30pm on March 21st at the Outdoor Adventure & Travel Show at the Stampede Park, BMO Centre in Calgary. On Tuesday, April 28th at 7:00pm, Kathy Plachta and Jean-Francois Cianci will be speaking about volunteering with the GDTA at the Alberta Wilderness Association office, 455 ‐ 12 Street NW, Calgary. Follow our Outreach page and our Twitter feed for other upcoming GDTA presentations. Our very own radio star and Chair of the GDTA, Dave Hockey has been a busy man these last few weeks. He’s been promoting the Great Divide Trail in a string of interviews with some of the biggest morning radio shows in Alberta and the BC Interior. In a matter of days he hit CBC Calgary, CBC Edmonton and CBC Kelowna. So what has got the radio folks eager to speak to Dave? Well, it’s because of the new Hollywood movie ‘Wild’ starring Reese Witherspoon. She plays a woman working personal things out by walking the Pacific Crest Trail. The movie is based on a book of the same name by Cheryl Strayed, who really did walk the trail, and it has people excited about long distance hiking in the wilderness. And Reese Witherspoon has now got an Oscar nomination for her role in the movie. Well, Dave has not only walked a good chunk of the Pacific Crest Trail, he is also a big part of building and preserving the Great Divide Trail right here in Canada. In addition he’s a great talker. It was a hook made in heaven for the radio guys and Dave snapped up the opportunity to tell the world about the GDT. Nice work Dave! When the snow blankets our trails and the window of daylight shortens, I welcome the opportunity to spend my weekends cozy inside. My bear-like mind likes to dream of all the food I am going to eat because with the onset of winter I have time to prepare meals for future trips. I am an avid dehydrator and I would love to share a few simple tips to spice up and lighten your trekking food load. If you maximize on this free hibernation time you can truly amp up your trail mix, fill your house up with delicious smells of future meals and set your stomach to grumble while saving money and time for the future hiker you. When you’re doing a long distance hike, it doesn’t take long before you’re sick of peanuts and raisins. By dehydrating your own fruits ahead of time, you are adding greater nutrition and taste-bud pleasing variety into the mix. Bananas – peel your yellow ripe banana and cut into 1/8-1/4″ slices. Dehydrate at 135°F until leathery. Apples – wash, peel and core apples, cut into 1/4-3/8″ slices or rings and dry at 135°F until pliable. Sprinkle with sugar or cinnamon for an extra sweet kick. Strawberries – Wash your large, firm and red strawberries, remove caps and slice 1/4-3/8″ thick. Dry at 135°F until leathery and crisp. Blueberries – Wash your ripe blueberries and remove stems. Blanch your blueberries whole for 15-30 seconds in boiling water before drying at 135°F until leathery and crisp. Pineapple (personal favourite! )– rinse the pineapple, cut off the crown and peel so there are no fibrous areas. Once cored, cut into 1/4-1/2″ slices or wedges and dehydrate at 135°F until pliable. Check out Alberta boys, Jake Alleyne and Liam Harrap’s blog of their incredible 252-day, 5,507-kilometre journey from Jasper to Mexico on the Great Divide in 2014! Trail and Road Conditions Update It’s winter in the Rocky Mountains! Expect snowy, icy or wet trail conditions. Snow cleats, snowshoes or skis are required. Expect cold temperatures, well below freezing overnight and be prepared for extreme weather conditions when travelling into the backcountry. Temporary Trail Closure (November 1, 2014 to February 28, 2015) – Jasper National Park: The GDT is closed from Four Point Campground to the Signal Mountain trailhead near Jasper to prevent trails from facilitating an unnatural level of predator access to threatened woodland caribou. Winter conditions exist on mountain highways and roads and seasonal winter closures are in effect. Roads can be snowy and icy so check for the latest conditions before you travel and carry chains and/or winter tires. For more information, check out Alberta 511 and Drive BC. The Great Divide Trail Association is a membership organization built by the support of people like you. Together, we share a common vision: the completion and long‐term preservation of the Great Divide Trail. By becoming a member of the GDTA, you are supporting the trail experience that you love and contributing to the legacy of the Great Divide Trail. A $30 Annual GDTA Membership gives you up to date information and trip‐planning resources for the Great Divide Trail; voting status at meetings of members of the GDTA; eligibility to serve on the GDTA Board of Directors; invitations to participate in trail classes and volunteer trail projects; and the knowledge that you are helping to protect and preserve the Great Divide Trail. Check out our website for more information on how to become a member today.